Is Turkey going Islamist? Is it on the road to implementing Islamic law, known as the Shari'a? I replied in the affirmative to these questions in a symposium at FrontPageMag.com a month ago. Turkey's Prime Minister Recep Tayyip Erdoğan, I wrote, plans to undo the secular Atatürk revolution of 1923-34 and replace it with the Shari'a. I predicted the leadership of his Justice and Development Party (known by its Turkish initials, AKP) will use the democratic process only so long as this serves its purpose. It will circumscribe, or even terminate, political participation when the right moment comes. The end result, I predicted, could be an "Islamic Republic of Turkey." In the jargon of Turkey-watchers, I made the hidden-agenda argument about Mr. Erdoğan and the AKP. The Turkish press gave my comments wide publicity, more often than not disagreeing. Fortuitously, the Nixon Center and German Marshall Fund then invited me to join a Euro-American group for intensive discussions last week in Istanbul and Ankara with Turkish politicians, journalists, intellectuals, and business leaders. Making the trip more piquant, many of our interlocutors knew my views and quizzed me on them, then gave me quite an earful. 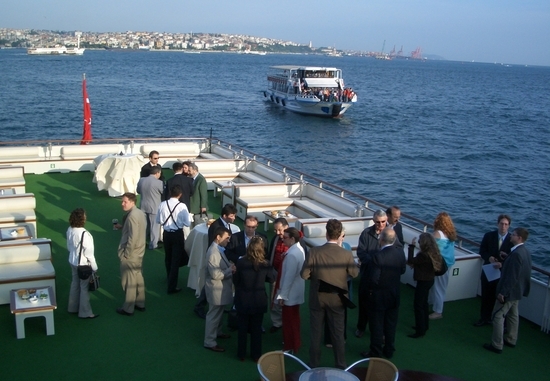 Nixon Center group at the Bosphorus. Their arguments left me, I must admit, less certain of Mr. Erdoğan's intentions than when I arrived. The case for a hidden agenda starts with the fact that Erdoğan and many of his colleagues began their careers in an Islamist party explicitly seeking to undo the secular order of Turkey. They confronted what is colorfully known as the "deep state" (the military, judiciary, and bureaucracy – collectively, the keepers of Atatürk's secular legacy) and emerged the worse for it, sometimes ejected from high office or thrown into jail. The smarter Islamists learned from this experience and made changes. Those changes, it bears emphasis, were tactical in nature (i.e., pursuing their goals more subtly and slowly), rather than strategic (accepting the secular order). This fits a known pattern of Islamist dissimulation (for another example, recall Al-Qaeda's instructions to its adepts). 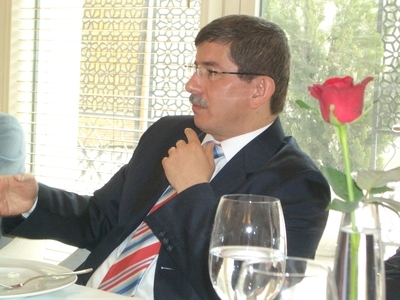 The group met with Ahmet Davutoğlu, foreign policy advisor to Prime Minister Erdoğan. Actions that confirm one's doubts about the AKP having changed goals since it came to power in late 2002 include attempts to criminalize adultery, to transform religious instruction at public schools into propaganda for Islam, and to loosen the penalties against free-lance Koranic instruction. Condemning Christianity as a polytheistic religion and purging members of the Alevi minority from the government's Religious Directorate also raise red flags. The case against the hidden-agenda argument notes that politicians do learn from their mistakes, they mature, and they change goals. If other politicians can evolve (think of Germany's foreign minister, Joschka Fischer, or Israel's prime minister, Ariel Sharon), why not the AKP leadership? No longer hotheads seeking to overturn the system, they now work within it. Limited efforts to the contrary, the AKP has not basically challenged the secular order. Interpreting the AKP can take on the quality of a sophisticated intellectual puzzle, with the same evidence lending itself to contrary explanations. Take the AKP's strenuous efforts to win acceptance as a full member of the European Union by bringing Turkish practices into conformity with EU standards. Does this fit the Islamist agenda by expanding the rights of religious practice and reducing the military's role in politics? Or does it fit the secular agenda by making Turkey more fully a part of Europe? Both can be argued. Some Turks don't bother to speculate about the AKP's intentions, holding that the party cannot overturn secularism in Turkey because of several factors: secularism's entrenchment and wide popularity; the deep state's ultimate power to thwart the Islamist agenda of elected governments; and the AKP's specific limitations. On this last point, the party combines several disputing factions and it has very fast grown large; both of these suggest that it cannot serve as a disciplined instrument for the ambitious project of overturning the existing order. In all, I now find the evidence insufficient to judge which way the AKP leadership ultimately wants to go – whether to stick permanently within the secular framework bequeathed by Atatürk or to overthrow it. Things might become clearer in 2007, assuming Mr. Erdoğan then becomes president of the republic, with all the powers that office confers. For the moment, Turkey's secular order remains robust; I cannot help, however, but expect a major struggle over its future course. 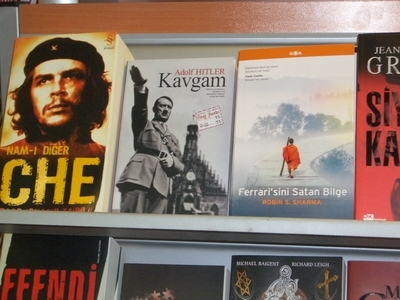 Seen at a bookshop at the Istanbul airport. Note "Mein Kampf." In a party speech made 19 years ago, when he was mayor of İstanbul, Erdoğan said that "we" -- without clearly stating who he meant -- were in a struggle to create a new order that would dominate society. "What is this struggle?" Erdoğan asked, providing the answer: "It is for the truth, which is unwavering at any place or time, to rise to power. If the chain of command above me tells me that I must wear a priest's robe to better this struggle to power, I say I will. I can even put on a cassock. Is this described in the method [the ways of political Islam]? Of course it is."